Are you and your significant other getting ready to have a new baby? If so, the time you have to set up the nursery will be limited, so it is important to get started early to give you plenty of time to make the perfect nursery for the baby when he or she arrives. One piece of furniture that you will need to consider is a rocking chair or a glider for the nursery. You will be spending a lot of time in the room with your little bundle of joy, and you may even end up spending a lot of your sleeping hours in the nursing chair you select. 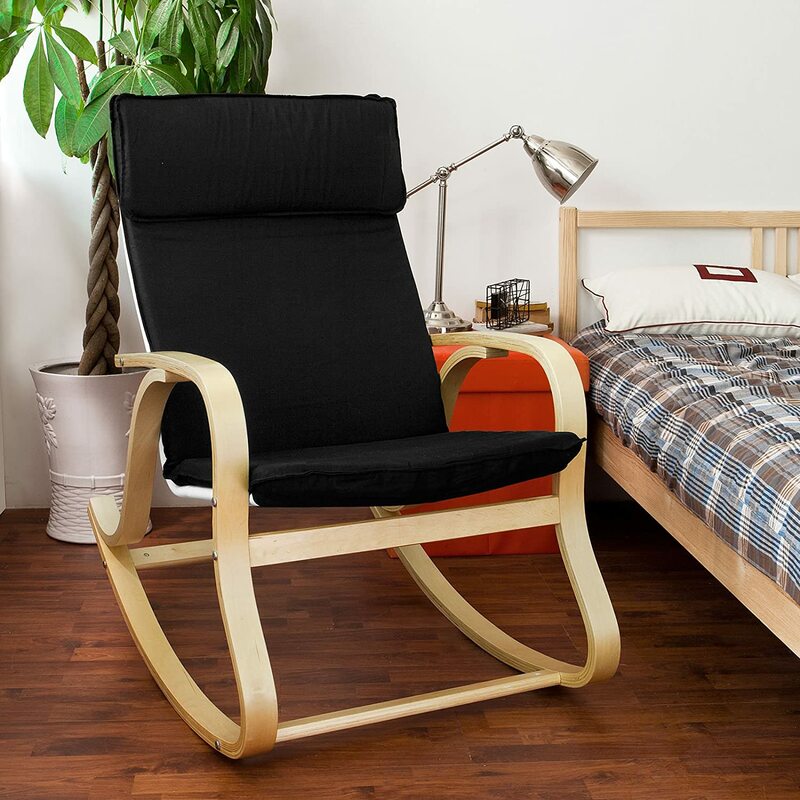 We have comprised a list of a few of the best rocking chair choices available on the market. We have also included a list of pre-purchase considerations for you to read over. Storks are known for delivering babies so why not let Stork Craft create a customized chair to fit your nursery needs? They have been leading the infant and child furniture industry since their inception in 1945. For over 70 years they have been committed to making durable, innovative furniture that will make a positive impact in the life of a parent. In addition, they are all provided to you at an affordable low price point. The custom Hoop Glider and Ottoman, which is our gold pick, is the perfect example of the quality that is produced from the company. 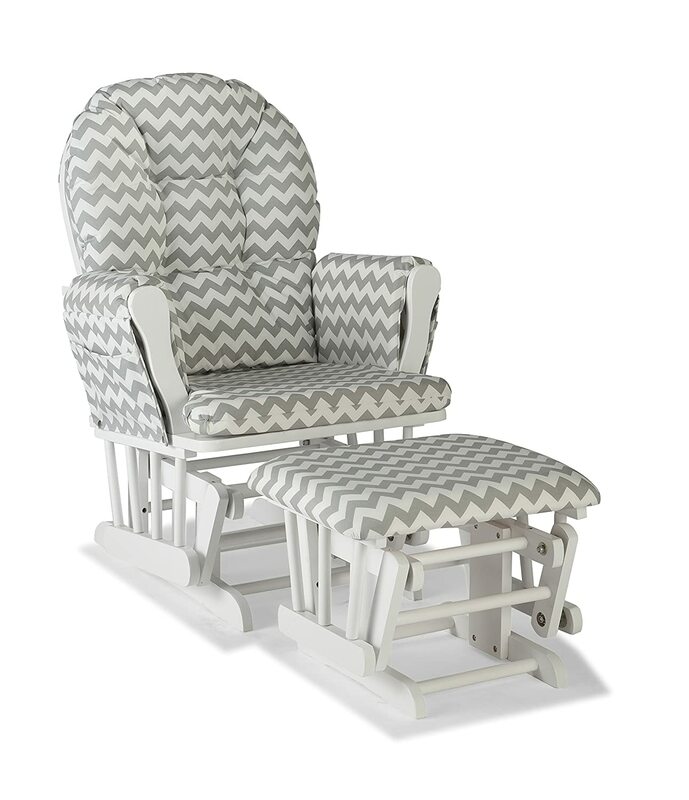 This glider is the perfect solution to your nursery needs. It has a solid wood base that is covered with a beautiful fabric that is designed to look amazing in any room. The chair is spacious enough for you and your baby to fit and be comfortable, and it has thickly padded arm rests to give you a soft place to rest your arm as you are nursing. The arm cushions are fitted with pockets that allow you to conveniently store the remote for the television or a book to indulge in when your child decides that it is nap time. On the other hand, if you are tired from a lack of sleep, then you may want to take advantage of a little quiet time and relax yourself. The seat cushion is filled generously to ensure that you are comfortable sitting in it for an extended period of time. They are also easy to remove and wash by hand in the event of a spit up or any other mishaps that may end up on the fabric. It is not recommended to wash the fabric in a washing machine, as that may deteriorate the quality. The matching ottoman is a great way to help you relax and be more comfortable. If you are worried about finger pinches in the gliding mechanism of the chair as your child grows, there is no need to fret because all of the ball bearings are covered and enclosed to ensure their safety. This glider comes in a plethora of color options to fit your décor. The base can be white, black, cherry, grey, or espresso. All of the cushion options sport a lovely chevron design, which is an inverted v-shaped pattern that zigzags across the entire length of the fabric. The cushions can be selected in grey, navy, pink, citron green, or a turquoise chevron coloration. The unit comes with a one year warranty that includes free replacement parts any time that they are needed. 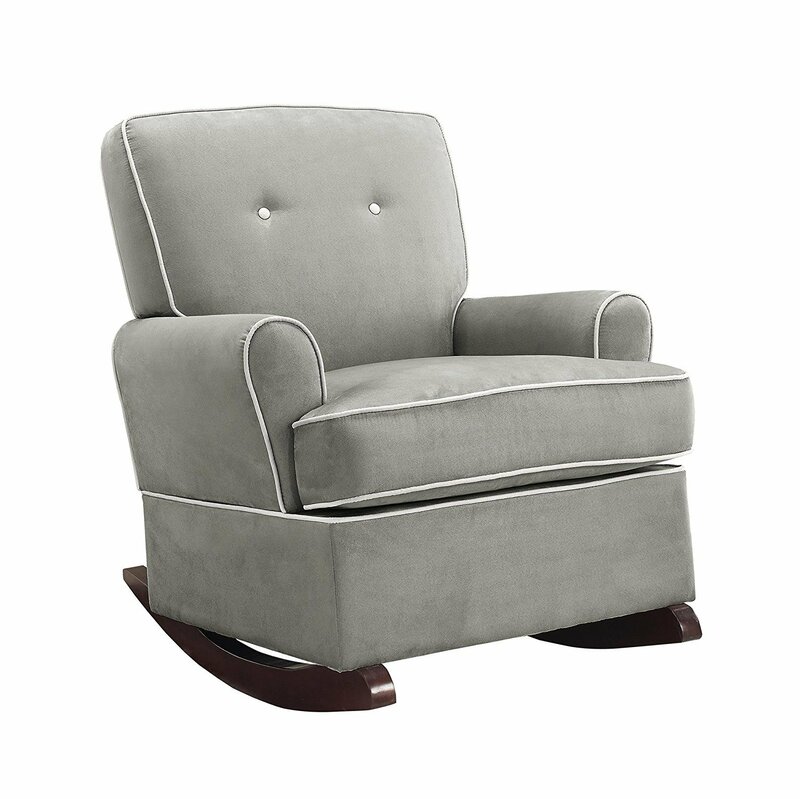 Our second pick, which is manufactured by Baby Relax, is the Tinsley Nursery glider chair. It features an extremely durable construction that is set on espresso colored rocker feet. The chair has a contemporary design that you often see in a traditional living space. It is designed with two toned micro fabric upholstery that is basically one solid color with trim in another. In addition, the back comes with button tufting that gives it a classically beautiful look. Insofar as comfort is concerned, this glider is designed to have an extra wide seating area that will be perfect for reading a story to two toddlers at the same time. It is also large enough to change positions and rest your head for a moment. It does not recline, which is a downfall, but it has a 21 inch back that will still allow you to rest your head when you need. The seat and the back rest both are fitted with extra cushioning to make sure that nursing and cuddling you infant does not give you a stiff body. The back rest provides great lumbar support as well. You can purchase this nursery rocking chair in a variety of neutral colors, which include grey, beige, and light brown. It can continue to be used in the nursery as your child grows, but since the fabric is designed in color options that work well with most décor, it can be used in another living space if you prefer. The chair may need to be partially assembled when you purchase it, but it also includes a warranty that lasts for 12 months after the purchase date. Our bronze pick, which is the Angel Line Monterey Glider and Ottoman, is a model that is very similar in design to our gold pick. It is a glider and ottoman combination that features a solid wooden frame. With such a solid construction, you can expect this nursery rocking chair to last. In addition, all of the metal bearings that are used to make the glider functional are enclosed to ensure your safety as well as that of your child. The arms of the unit are padded to give you a comfortable place to rest your arms, which is a great feature that you will be using frequently when you are nursing your baby. The arm rests also have storage compartments that can be used to keep things close at hand to read or watch when the baby falls asleep. 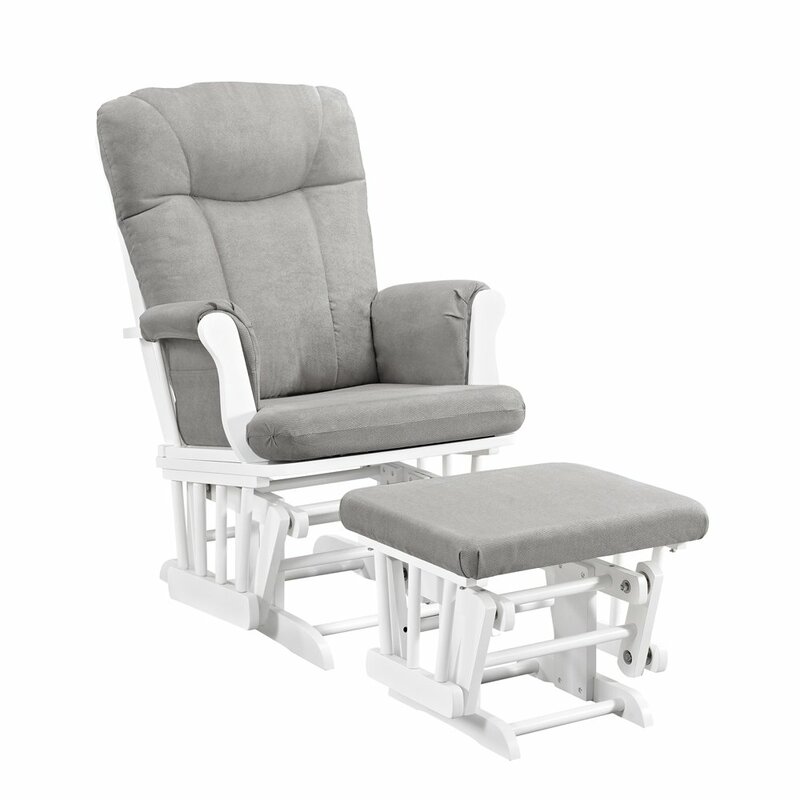 The seat of the Monterey glider and ottoman is very spacious, which gives you plenty of space to move around until you are comfortable, it also has high arm rests, which will make it a more comfortable option for taller individuals. The chair is covered with a polyester fabric that can be purchased in a few neutral colors like grey or beige. It can also be purchased in a grey chevron design if you like the inverted v-shaped design better than a solid one. The base of the chair also comes in two colors, which are white or beige, so you can decide which option fits your décor the best. The cushion of this glider is removable, so it can easily b washed when needed. It is not recommended to wash the cushion in a washing machine, so washing it by hand is going to be the best option for you to preserve the quality of the fabric. Our fourth and final pick is the SoBuy rocking chair, which is marketed to be a comfortable and relaxing seating option. If you are a soon to be new parent, then you are likely getting the nursery in order, but with all of the baby needs that you have been focusing on, your budget may be a bit lower than you’d like. If that is the situation, out ballin’ on a budget option is perfect for keeping the cost low and your budget in check. The rocker is designed with a metal arm rest frame design that is covered in a beautiful birch veneer. The veneer is then coated with a clear acrylic lacquer that is designed to seal the frame, which makes it more durable for repeated use. The rocking chair has a removable cushion that is covered in soft cotton fabric. In addition, it is also generously cushioned so that the seat is extremely comfortable to sit on. Since the cushion is removable, it can easily be spot washed or hand washed, but it should not be placed inside of a washing machine, as that can destroy the fabric. The SoBuy rocking chair is available in a plethora of color options that allow you to match the color of your rocker to the nursery where it will be used. It can also be placed in another location in the event that the nursery is turned into a room with another purpose. The cushion is available in black, white, grey, and red, but if you prefer a bit more flair in your furniture, than you can also select another option that is beige or off white with a plethora of thin, vertical wavy lines in multiple shades of brown. The most important consideration that you should make when purchasing a new rocking chair for your nursery is comfort. Your comfort is going to be crucial, but it is also important to make sure that the arm rests are at a good height so that the baby can be comfortable as well. Make sure to find a rocking chair or a glider that is big enough to allow you the space to move around. Sitting in one position will get tiring, especially if the cushioning is not supportive enough. Another aspect that you need to consider is the back support on the rocker. Before you settle on a rocking chair for the nursery, make sure to test out a few options and see if the back support and comfort level is to your liking. You can also have your significant other try out the rocker, especially if they plan to use it. Most nursery rocking chairs are built to be sturdy; especially since it will need to hold the weight of you and your child for several years. If you can find a chair that is crafted from solid wood, you are sure to have a durable piece of furniture that will last for many years. Any rocking chair or glider that you buy is going to have a lot of moving parts that can easily pinch little fingers. Of course this is not a real risk when they are just months old, but when they begin crawling, it can be a hazard that you will want to avoid. A locking mechanism is the perfect solution for preventing those little finger pinches as well as a way to safely get up from the chair with your baby in your arms. If you are planning on getting a bit of rest on the chair, locking it so that it cannot rock or glide can make sure that it is safe for you and your child. Most likely you will be spending a lot of time in the nursery. Falling asleep in your new rocking chair may become part of your normal routine, so it is important to find a chair that can recline and give you a comfortable place to rest your head as well. Most of the reclining rocking chairs that you will find only have a six-inch recline option, but when you are drained from restless nights, any amount of recline will be a great comfort, especially if you can catch a little shut-eye. A rocking chair may not need to look perfect in a nursery, but do you want it to have a certain aesthetic appeal for when your child no longer needs a rocking chair in a nursery? Maybe you will have more kids, in which case the rocking chair may continue functioning as a comfortable place that you can bond with your children. Perhaps it will be repurposed into a chair that is used in your main living space. Think about the design you want your chair to have. The fabric can be a colorful option that is perfect for a nursery, or it can be a more subtle, solid coloration that can blend in with any décor. Dark colors do not show stains as easily, so you may want to find something that will hide the wear and tear of being a nursery rocking chair. Purchasing a rocker with washable cushions and fabric will also make it easier to keep stain free. You also want to consider the wood of the chair. If the rocker has exposed wood, then it is important to find a style that you like. In addition, some rockers and gliders have matching ottomans where you can prop your feet up and get more comfortable. The bearings in a rocking chair, specifically in a glider wear out over time. Years of rocking your child on the chair could mean that these parts need to be replaced, so it is important to find a rocking chair for your nursery that is covered under a manufacturer’s warranty. Many companies offer a lifetime warranty, but if you cannot get such extensive coverage, then look for at least a ten year warranty. A rocking chair is a great way for a mother to relax and nurse or comfort a new baby. Finding a chair that fits your needs is important, as you are the one who will spend the most time in this seat for the next few months. If you can get a rocking chair or glider that is comfortable for you now that can be repurposed a few years from now as a chair for your child to sit in, then you have been successful in your search. Take a look at our top picks to see if they are right for you, if not, keep searching until you find one. Don’t forget to use our pre-purchase considerations to help you through the process.